We are SO excited about our A Very Toddler Easter series that we are co-hosting with Susie from Busy Toddler. Each day this week, we will be sharing a toddler-friendly Easter activity idea! 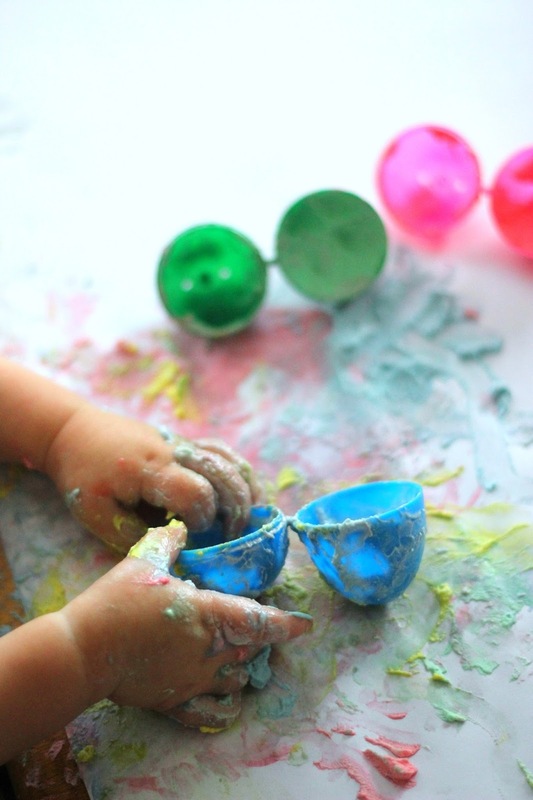 Make sure to come back daily to follow along with our A Very Toddler Easter activity ideas! PS- This post contains Amazon Affiliate links. Toddlers thrive on repetition. They love repetition because it helps them learn and it feels good. With all of the unknowns that can spring up and rock a toddler's world, it is nice to have a few familiar faces, or activities to do. One of our favorite Easter activities that we repeat again and again is hunting for eggs (of course!). Another favorite, is painting WITH plastic eggs. This year we decided to repeat our favorite Easter activities (to keep things happy and comfortable) AND throw in a curve ball and put the paint INSIDE the plastic eggs. I was first introduced to crack egg painting by Deborah at Teach Preschool. I love it and it is such a neat way to paint. 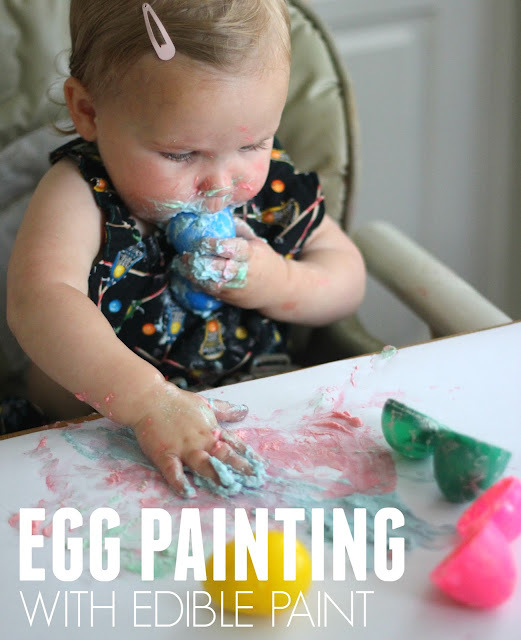 We adapted this crack egg painting idea from Teach Preschool and made a thicker edible paint to use with my 15-month-old toddler . Get started by whipping up your heavy whipping cream until you get some peaks in your cream. Then add vanilla and sugar until it is stiff enough. Separate the cream into bowls and then add colors to each bowl. Mix the colors in and then start loading up each plastic egg with colors! I stuffed each egg a different color and then put out some white paper for painting! Once the eggs are stuffed, pass them off to your toddler. It is so fun to watch as they explore the edible paint and start covering the paper with their creations. My daughter was not about to waste a moment... so she licked one egg while she painted with another. It was SO FUNNY! My kids are so resourceful sometimes! LOL. To paint with a plastic egg all you need to do is crack it open, dump or scoop out some paint, and rub that paint all over the paper. We rubbed it on our bodies and faces as well! We used a goopier/thicker recipe so that kids would have fun playing with a different sensory experience. Afterwards, she went straight to the bath. I think that is our new MO after every activity these days. Boy does this little girl know how to get paint in places that I don't even think her hands can reach!! 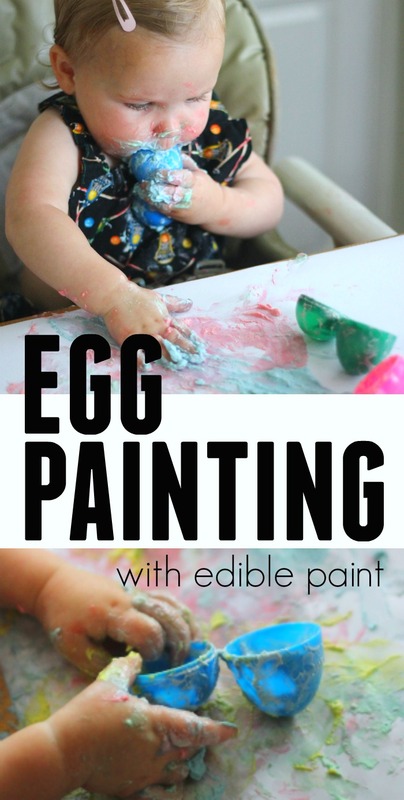 HAVE YOU EVER PAINTED WITH PLASTIC EGGS BEFORE? HAVE YOU EVER PUT THE PAINT INSIDE THE EGGS? If you haven't done it yet, try it! In the meantime, check out our A Very Toddler Easter Series and hop on over to Busy Toddler to see what Susie has whipped up for you to try this week! It is bound to be totally fun! Is there an alternative to using the powdered sugar?